Travel can be a stressful time for everyone, but for those travelling with people who have an EGID or food allergies there are a whole new set of challenges. Whether you are travelling for a holiday or needing to attend specialist medical appointments, we have broken down how to plan for a trip and the below tips are to help you with your travels. If you are on medications and/or on elemental formula remember to pack them with their pharmacy label. If you are also at risk of anaphylaxis, ensure you bring multiple autoinjectors with you that are easy to access. Take numbers of your doctors and specialists in case you need advice whilst you are away. Look up locations of hospitals and keep a list of emergency numbers for each place you plan to visit and key stops along the way. If you are travelling to medical appointments check your state health department’s website as there may be travel allowance or reimbursements that are able to be claimed. 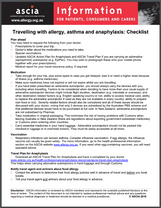 The ASCIA travel plan checklist and an ASCIA Action Plan for Anaphylaxis should be completed by a medical or nurse practitioner before you leave. They aim to assist passengers at risk of anaphylaxis who need to carry adrenaline (epinephrine) autoinjectors like EpiPens on airline flights. They can be downloaded using this link. Another thing you should take with you is a letter from your doctor outlining your diagnosis, allergies and any medication, formula or food that you may need to take with you. Make yourself familiar with the airlines policies regarding carrying medication on the flight as they can vary between carriers. Also, be aware of airline policies on liquids on flights. For those traveling with a feeding tube pump and supplies it’s a good idea to contact the airline if you require extra luggage allowance to accommodate these. When booking airline travel, contact the airline and inform them before you fly of the allergies and plan meals that are safe that can be served, or organise alternative food to be arranged for the passenger. You can bring your own food on the flight so that if they don’t have any meals available to cater for your allergies, ask about re-heating and storage options. If you have a nut allergy, you may want to choose an airline that does not serve nuts if possible. Unfortunately, airlines cannot guarantee nut free flights or areas on the plane so compare the different carriers. 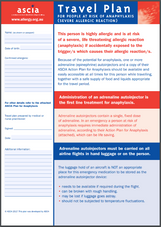 Allergy & Anaphylaxis Australia has an Airline Comparison guide available here. Time of travel should also be considered depending on the allergies you have, such as avoiding morning flights and breakfast meals if you are allergic to milk and eggs etc. On the plane, consider informing people around you of the allergies as well, but keep in mind those people can eat their own food and food given to them by the airline if they choose to. International travel, whilst may be daunting, can be wonderful with adequate time and planning. If you are travelling to a non-English speaking country, ensure you learn translations for important words you may need in case of an emergency. You should also source local food items that are ‘safe’ and locate hospitals and emergency centres in the areas you are travelling. Arrive to the airport early and remind the flight attendants of the allergy. Bring wipes and ask if you can wipe down your area before the passenger with allergies boards to reduce cross contamination. It is also recommended you take extra supplies of autoinjectors. Generally, meals are not served on busses or trains, but meals are available to purchase at stops or in meal carts. In this case it is easier to bring your own food. Like planes, seating areas tend not to be cleaned thoroughly between trips so again bring wipes to reduce cross contamination. If you wish, inform passengers travelling near you of your allergies as well. This is a lot easier because you can bring lots of your own food. Consider freezing pre-prepared meals and bringing an esky or a portable fridge with you. Plan where you stay so that you are close to places you can source allergen friendly food from. Ideally, find a place to stay that has an equipped kitchen. The set-up of kitchenettes in hotels can vary considerably and so it may be hard to prepare food. Always call and confirm what the kitchen comes with before you book. Accommodation which is close to grocery shops is also something you may want to think about as well. If you have an anaphylaxis risk allergy it can be helpful to wash up all the cutlery and crockery etc. when you arrive at your accommodation as they may not have been washed up very well by the people before you and they could have cooked with your allergen that morning. If you have skin sensitivities it is a good idea to take your own washing up liquid and tea towels that you know are safe for your family. It may also be best to take your own pillows and linen depending on your allergies as some may have feathers or wool or may have been washed with detergents that could potentially make for an uncomfortable stay. If your family is looking for a retreat, make sure you look at Ronald McDonald’s family retreats which are designed to take families with seriously ill children. Their website and all the information can be found here. 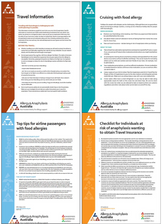 Be sure to take out travel insurance but compare policies from multiple companies as not all will automatically include anaphylaxis or your diagnosed medical condition e.g. EGID/EoE. Plan well and your trip should go smoothly and helps ensure all members of the family have a great time. Unless stated otherwise, advice offered on this page is from the Author, who is non-medically qualified, however the medical content on this site has been reviewed for accuracy by our Medical Advisory Board. Thank you to our volunteer Jessie for writing this page.